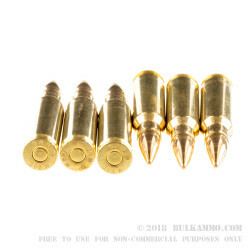 The standard load for the .308 Winchester round, this is a modern offering by a company that has a proven history of producing some of the most reliable ammunition in the world. This is a 147 grain full metal jacket load from Sellier & Bellot, the Czech powerhouse owned by CBC of Brazil. The forte of the S&B company is manufacturing top quality reliable ammunition in the classic military cartridge platforms, that utilize modern components and are made to a specification that would be acceptable by the most discerning user. Sellier & Bellot are not the cheapest providers of ammunition. They are also not the top tier for personal defense. 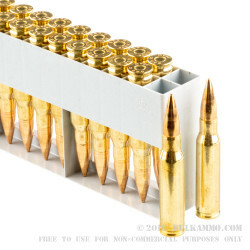 What they do well, is provide high reliability ammunition in calibers that many shooters need. Their ammunition is top quality and it has a history of being very accurate and consistent in its manufacture. If you need a mainstream 308 Winchester ammo, this is a great choice. The 147 grain projectile achieves a velocity of 2808 feet per second and a energy of 2580 ft. lbs. at the muzzle. These performance numbers put it squarely into the hunting and target ranges. It is suitable for large game and for any range duties. This is a 500 round case lot. Great ammo, came quickly after my order. Very reliable loads so far. Nice, clean, accurate, inexpensive. Great service. Q: Is this ammo steel core? A: Hello Stan! 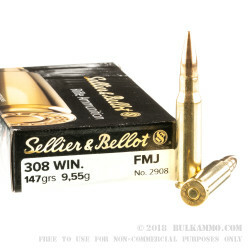 The Sellier and Bellot .308 ammunition does not feature a steel cored projectile. Q: Im aware of the 1980-82 production run on this ammo to be corrosive. Consensus was that it had "corrosive" primers. Is this still the case now-a-days? Or does it just pertain to a certain "make" of the S&B ammo? Just need to know so I can pay extra special attention to my rifle cleaning regimen. A: This S&B .308 is factory new ammo which is not loaded with corrosive primers. We are unaware of any factory new .308 ammo available for sale in the United States which is loaded with corrosive priming compounds. A: Thanks for bringing this to our attention. We're working on improving the information presented on our site all the time. The muzzle velocity of this S&B .308 is 2808 fps and the muzzle energy is 2580 ft-lbs. 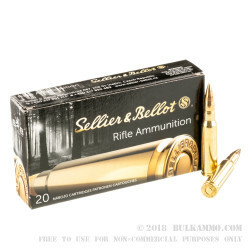 A: The muzzle velocity of this Sellier & Bellot ammo is 2808 fps.